A Pakistani court on Thursday dismissed a petition filed by an Indian lawyer and social worker seeking custody of a deaf and mute Indian girl stuck in Pakistan for over a decade, refusing to issue orders for her "forced repatriation". Judge Ahmed Saba of the district and sessions court here heard Geeta, 23, through an expert but disposed of the petition filed by Momineen Malik in which he had sought the repatriation of Geeta, who has been in the care of the Edhi Foundation charity since the last 13 years. Edhi spokesman Anwar Kazmi told PTI that the district and sessions court in south Karachi district rejected the petition that Malik, the social worker and lawyer from Haryana, had filed with the help of local lawyers to seek Geeta's custody through an order for her return to her parents in India. 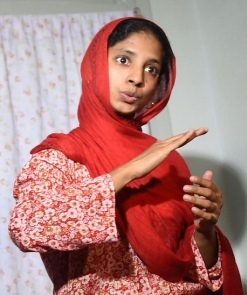 Geeta was brought by the Punjab Rangers after she was found alone on the Samjhauta Express which she apparently boarded by mistake in India and landed in Lahore via the Wagah border. She told the court through an expert that she wanted to go back to India, Geo News reported. Malik had moved the application under Section 552 (power to compel restoration of abducted women and girls) of the Pakistan Criminal Procedure Code. The judge, after hearing arguments from both the sides and recording statements, observed that the applicant had no privilege to seek such remedy directly, adding that the proper way to go about the matter is to use diplomatic channels since the matter involved Pakistan and India. The court refused to issue orders for her "forced repatriation". The judge noted that Pakistan and India had signed agreements which dealt with such matters and observed that in Geeta's case it was the responsibility and domain of the Indian high commission to move the Foreign Office to transmit the request through Sindh's home department. On Thursday, Malik had expressed his wish that the Indian government carries out DNA tests of Geeta and five families that claim she is their daughter to confirm the truth. Malik filed the petition last Saturday after Geeta's case attracted the attention of the Indian and Pakistani government besides the media for an uncanny resemblance to the recent Bollywood hit "Bhajrangi Bhaijaan", the Salman Khan-starrer.